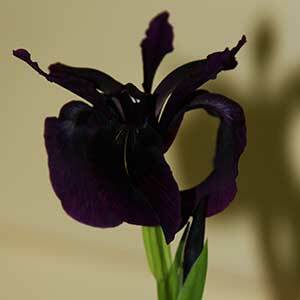 With very dark flowers Iris chrysographes is a rhizome framing species that prefers damp soils with good drainage. These are a Siberian Iris, flowers are best described as a deep purple to indigo with each petal splashed with a flash of golden yellow. You can grow this iris beneath taller shrubs in the garden border as long as it gets good sun. and is is moist soil. This is an Iris that grows from small rhizomes, not bulbs as is sometimes suggested. The rhizomes will spread over time to form a clump and you plant them with room to allow for this. When planting, choose a humus rich soil or potting mix. One that retains moisture however is still free draining. Choose a deep container, as although the root system is on the fine side, it is long. The rhizomes need to be planted about 2 – 3 cm deep (1 inch). Water in with a liquid seaweed fertiliser to promote new root growth and remove the chance of any air pockets. The rhizomes are small and can be planted at around 15 cm (6 inches) apart. If you are buying these plants bare rooted, plant immediately to avoid the root system drying out. Each year fertilise in late winter with a top dressing of aged cow manure and liquid seaweed fertiliser. Height – To around 80 cm when in flower. Flowers – Very deep purple to almost black. Foliage – Mid to deep green and upright. Drought tolerant – Medium over summer. Iris chrysographes is not widely available for sale.